Like creatures of the Night? Horror? Fantasy? All with a twist of SciFi? Check out our stories and start a new chapter in your life! NIGHT, the series, created and written by Troy Hasbrouck, is not just another vampire of werewolf story but encompasses each and every creature of the NIGHT. Future issues include everything from Zombies to Minotaurs and don't be surprised if some old horror favorites show up too. Troy Hasbrouck is at it again with this NIGHT spin off comic. It's a continiuty free series featuring stories from Sabrina Voght's past, present and future. Each issue is designed to be a stand alone issue featuring a different artists specifically chosen for artistic creativity to match the story. The Destiny of the Dragon series, created by Rob Porter and written by Rob Porter and Troy Hasbrouck encompass time and space, magic and mystery, the epic tale of Dragons. The first in the series, Daughters of Merlin, joins the on going journeys of the Dragons. NIGHT, the series, created and written by Troy Hasbrouck, is not just another vampire and werewolf story but encompasses each and every creature of the NIGHT. Future issues include everything from Zombies to Minotaurs and don't be surprised if some old horror favorites show up too. Sabrina Voght finally catches her suspect and she let's him go? Meanwhile the gang war heats up between the Reds and the Phreaks and David Skinner is caught right in the middle. Things begin to get tense! The true villian is revealed and Special Agent Sabrina Voght has no choice but to team up with her former suspect, werewolf David Skinner but can Skinner deal with Voght battleground revealation? In this issue, FBI Special Agent Sabrina Voght is missing and David Skinner, a young werewolf who she aided, hunts for her trail only to find it end at the Blood Countess herself, Elizabeth Bathory. Vampire vs. werewolf action ends this issue as usual, on a cliffhanger! Sabrina Voght awakes in a lavish state with no memory of her torture at Elizabeth Bathory’s hands but appearances are deceiving as her situation quickly deteriorates to combat and she finds herself once again fighting for her life. This picks up right where Night volume 1 number 5 left off. David Skinner and FBI agent Andrew Whildon are sidetracked from their search for Sabrina Voght by the broad day kidnapping of a young girl by a werewolf? Follow as they investigate the true nature of the crime in this character driven werewolf buddy cop mixture! This is it! This is what you've been waiting for! Sabrina Voght vs the Minotaur! 24 Pages, Full color! Awesome horned action! FBI Special Agent Sabrina Voght escapes an icey imprisonment in a vampire sanctuary only to find herself wandering the snow plains of northern Canada with a young girl she rescued from the same fate. A strange hermit rescues the pair and Sabrina discovers it might have been safer to stay in the ice cavern! Clayton Moore provides the pencils as Agent Voght investigates a zombie sighting in a small southern town. She finds more than she expects between the gravestones and vampire-zombie-werewolf action quickly ensues! Dave Crowson provides old school pencil shading for Sabrina Voght's first night out, her first mission with theFBI. Soft pencils provide a visual counterbalance to the grizzly werewolf action! Another blast from the past tale of Agent Sabrina Voght. This time we‘re bringing you a slice of the seventies in black and white watercolor by Erik Williams! In this issue meet Layla, an alpha female werewolf who doesn‘t take kindly to someone else recruiting her pack. Camelot has fallen to the dragons and all is lost. Merlin has no choice, but to escape with his charges. They are the last hope to salvage anything that remains of the once mighty kingdom. They are the daughters of Merlin. Number 1 of a four issue mini-series kicking off the Destiny of the Dragon series of books from Jester Press. 24 pages, full color. Separated from Breeta in the time stream, Mina slams to Earth in a strange land with many unbelievable machines and sights. She has landed in modern times. Will her wizardry prove helpful in such a chaotic time of highways and the internet? One can only hope! A test in humility leads to a new discovery. Number 3 of a four issue mini-series kicking off the Destiny of the Dragon series of books from Jester Press. 24 pages, full color. The daughters successfully find Avalon and Merlin tasks them with rebuilding the Knights of the Round Table. Before their quest can begin, however, the dragons reveal where they have been hiding all these centuries. Hiding in the form of humans! Using time travel as a weapon, Mina and Breeta are transported to some distant future where they meet a Dragon rider by the name of Cyneska but is she friend or foe? Number 4 of a four issue mini-series kicking off the Destiny of the Dragon series of books from Jester Press. 28 pages, full color. Graphic artist by trade, Rob threw his hat into the comic book publishing ring with Destiny of the Dragon. He is the primary creative force behind Jester Press’ fantasy line and the series can only be described as epic. Beyond his artistic labors on this new series, currently mapping out the past, present and future of the Jester Press universe, Rob also handles all the web page design and occasionally finds time to color a book or two as well. Jason is a tatoo artist by trade but somehow we talked him into doing the artwork for the Walking Bread parody one shot. Unfortunately it will be a one shot because it's a lot harder to write bread jokes then you would think. His artwork is fantastic though and we hope to work with him again soon! 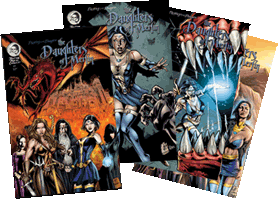 Edi has been providing the pencils and inks for the Destiny of the Dragon : The Daughters of Merlin mini series. He has completed the four issue mini and has moved onto other projects. His work has been great and has really given the book a feel that drops you right into the dragondom of it all! David has worked for fitness magazines and has an extensive commission list coming from his heavy convention schedule. He is currently working on Shades of the Night number 4 which introduces the JP universe to the Daughters of Merlin. The issue is being inked by indy publisher staple "Peter Pop" so this issue is going to be fangtastic....sorry, couldn't resist. Peter Palmiotti has been inking comics since 1991! He has worked for Marvel Comics, DC Comics, Image comics, Wizard Magazine, Valiant comics and a slew of independent publishers, mostly he is known for his work on AQUAMAN!. Currently he’s inking Lyle Pollard’s Tribulations and it‘s sister book, mini comic series Nova City Stories published by Highburn studios, Terra 2920 a sci/fi adventure published by Hantrack Idea men, Scottie Watson's Talon threw Dimestore productions and Seppuku Blues to be published by Red Handed Studios. His credits include: Aquaman (DC Comics), Razor (London Night Studios), Shadow flame (JGM Comics), Java (Committed Comics),Tribulations (Highburn Studios)....face it if we listed all of his credits you would be here till tomorrow still reading. Elias is providing the pencils and inks on the upcoming Night / Witch Hunter crossover with Monarch Studios. This is a shared project with Monarch so I can't say much here but the art looks great and we can't wait for it to be in print! © Copyright 2013 Troy Hasbrouck and Rob Porter, All Rights Reserved.